Decreasing body fat is a common goal for many people around the world. Whether for health reasons, sports performance or aesthetics. This post will help you understand body fat along with helpful tips to decrease body fat as well as information on losing body fat while gaining muscle. The information for this post is taken from our new book Nutrition for Sport, Exercise, and Health. The two main types of body fat are essential body fat and storage fat. Necessary for physiological functioning, it is found in bone marrow, the heart, lungs, liver, spleen, kidneys, intestines, muscles and fat-rich tissues of the central nervous system. Essential fat for men and women is approximately 3 percent and 12 percent body fat, respectively. In women, essential fat is higher because it includes fat in the breasts, hips and pelvis for reproduction. Storage fat is energy accumulated for later use and found around internal organs (visceral fat) and directly below the skin (subcutaneous fat). This is energy accumulated for later use and found around internal organs (visceral fat) and directly below the skin (subcutaneous fat). Storage fat increases over time when excess energy (calories) is consumed and decreases when more energy is burned than is consumed. Visceral fat wraps around organs like a blanket and contributes to inflammation. Higher levels of visceral fat are associated with higher risk for several chronic diseases, whereas subcutaneous fat might help the body fend off disease and protect it during blunt force trauma, such as a car crash. It is possible to be within normal weight yet have high levels of visceral fat. complications during pregnancy, such as gestational diabetes; high blood pressure, which can affect the health of the mother and the baby; premature birth; stillborn birth; and neural tube defects. To find out more about pregnancy and why you should still exercise check out Weight gain during and post pregnancy. Obesity also increases the risk of all-cause mortality (death from all causes). Worryingly more than 33 percent of adults and approximately 17 percent of children in the United States are obese. In the UK 24.9% of people are classified as obese according to the NHS. This makes the UK the ‘fattest’ nation in Western Europe. It is best to measure body fat directly (with calipers or a Duel-Energy X-Ray Absorptiometry) rather than relying on indirect measures such as Body Mass Index (BMI). BMI can incorrectly classify individuals with low body fat and high muscle mass as obese, while those with high body fat and low body weight can have a “normal” BMI even when they have an unhealthy amount of body fat. The various methods of measuring body fat are presented in Nutrition for Sport, Exercise, and Health. This table includes body fat % ranges and their classification. Excess fat around the waist is associated with increased risk of disease. The waist-to-hip ratio is used as a measure of higher waist circumference and reflects increased visceral fat better than BMI. 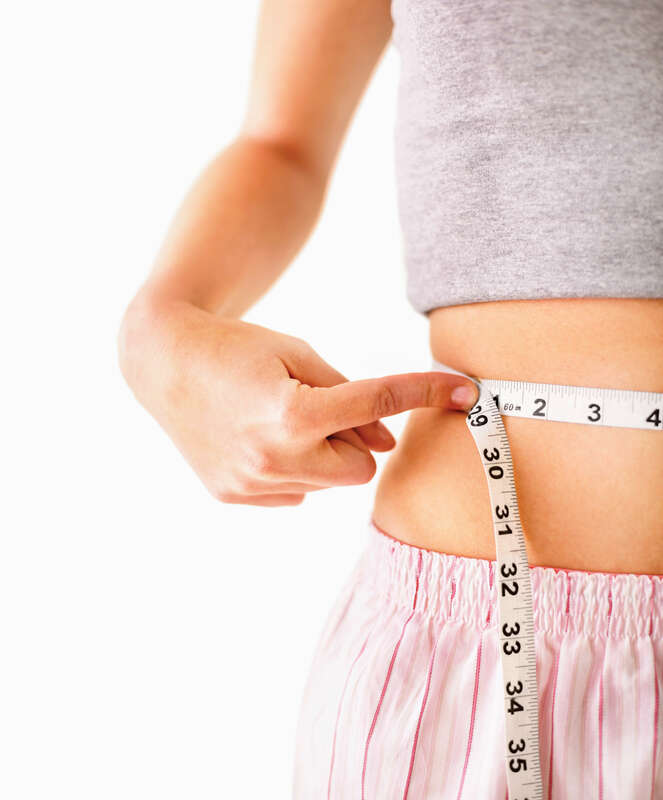 This system states that the ideal waist size for a male is 40 inch and 35 inches for a female. From an athletes point of view, different sports (and positions) vary in body fat percentages, as shown below. Bodybuilders and gymnasts will have a much lower body fat percentage than NFL linemen and shot putters. For more information on what professional footballers eat take a look at Diet and macronutrient intake of professional footballers. Studies examining weight loss show numerous approaches can be effective, as long as they create an energy deficit over time. However, losing weight too quickly can lead to a decrease in muscle mass, greater drop in metabolic rate (energy burned each day) than predicted by weight loss alone. This results in less energy available to train and get through each day. Generally speaking, rapid weight loss should be avoided unless warranted for health reasons. If you are competing in a sport, either recreationally or competitively, it is best to focus on weight loss during the off-season or in the base phase of training. If you are working on weight loss in-season or before competing, cut calories as little as possible to preserve muscle mass, prevent a large drop in RMR and minimise training and performance decrements. The first step in determining a healthy body weight goal is weighing in a euhydrated state (not dehydrated or over hydrated) and measuring body composition. These measures can be used to determine how much body fat individuals should lose to put them within an optimal range for health or, for athletes, within a sport-specific body fat range. A caloric deficit of 500 to 1,000 calories below estimated daily energy needs is generally recommended for weight loss. However, individuals with lower energy needs (women, older adults) in addition to growing children and teens should minimise their total caloric deficit to ensure they are getting enough nutrients for good health (more calories equals more opportunities to consume nutrients) and for growth, development and reproductive functioning. Excess postexercise oxygen consumption (EPOC)—the energy burned after exercise. Resistance training is critical for up-regulating muscle protein synthesis when dieting to help ensure muscle mass is maintained (or improved) during weight loss. In addition to burning calories during resistance training and in the time period after training, through excess postexercise oxygen consumption, the body requires energy (calories) to repair training-induced microscopic damage in muscle while laying down new proteins in muscle. Resistance-training programmes designed for weight loss focus on recruiting a greater amount of muscle mass in each session to maximise the amount of calories burned during the session and afterwards (excess postexercise oxygen consumption). For example, a programme might include more squats instead of calf raises or leg extensions. In addition to focusing on recruiting more muscle mass in each training session. Performing supersets is also a great way to increase total calories burned during and after exercise. Will Building Muscle Turn Me Into a Calorie-Burning Machine? Muscle tissue burns significantly more calories at rest than fat tissue. Though this difference is statistically significant, it might not translate to a very meaningful difference in calories burned over a short period. One pound of muscle burns 5.9 calories per day at rest, whereas each pound of fat burns 2.0 calories per day at rest. So if you gain 5 pounds of muscle, you’ll burn approximately 20 more calories each day. In addition to resistance training, incorporating aerobic exercise into a training programme can enhance total energy burned during the day. Steady-state (constant intensity) aerobic work sessions can be intermixed with high-intensity interval training (HIIT) to increase total energy burned. Although several studies have suggested HIIT training, which involves repeated bouts of high-intensity exercise followed by low-intensity exercise, increases energy burned during exercise and excess postexercise energy consumption to a greater extent than steady-state exercise. A systematic review and meta-analysis, including 31 studies, found HIIT training doesn’t lead to greater weight loss than steady-state exercise when matched for total calories burned. However, HIIT does lead to greater calories burned in a shorter period, so a person can get more results for a shorter time commitment. Note that HIIT training can be difficult for individuals who are very overweight or who have chronic health conditions or injuries. When you exercise at a lower intensity you burn a greater percentage of calories from fat than when you exercise at a higher intensity. However, you also burn fewer total calories per training session compared to training at a higher intensity. If weight loss is the goal, focus on total calories burned in a day rather than worrying about burning a greater percentage of fat, as opposed to carbohydrate, during exercise. If you burn more calories during exercise to help create a caloric deficit, your body will tap into fat stores for energy at other times of the day—when you are studying or watching TV, for instance. Studies show that changing your diet will lead to greater weight loss than changing your exercise programme. However, dieting alone (without exercising) leads to greater decreases in muscle mass compared to combining diet with exercise, particularly with anaerobic exercise (e.g., resistance training). A sound training programme is an essential component for altering body composition in favour of less fat and more muscle, but overall daily activity is important as well. Research shows many people compensate for increases in physical activity by being less active the rest of the day. They decrease their activities of daily living, so they burn fewer calories during the rest of the day when they are not working out. Activities of daily living include walking to class, cleaning, mowing the lawn, gardening and washing the car. Training can increase the total amount of calories burned in various ways, but the best exercise for weight loss is the one that an individual will stick with over time, both during the weight-loss period and afterwards, for weight maintenance. In addition to the risk of losing muscle while losing weight, it is more difficult to gain muscle when cutting calories because lower- calorie diets decrease the intracellular signalling necessary for the synthesis of new proteins in muscle. Also, muscle tissue can be less sensitive to protein when a person is dieting. Despite these challenges, it is possible to lose body fat and preserve or even gain muscle at the same time. Combine a high protein diet with an intense resistance-training programme. Studies show by doing this you can lose body fat and increase muscle. 31 overweight or obese postmenopausal women were put on a reduced-calorie diet of 1,400 calories per day (with 15%, 65%, and 30% calories from protein, carbohydrate, and fat, respectively) and randomised to receive either 25 grammes of carbohydrate (maltodextrin) or a whey protein supplement twice a day for the 6-month study period. The group receiving the additional protein lost 3.9 percent more weight than the carbohydrate group and preserved more muscle mass. In another intervention study, young, overweight, recreationally active men were placed on an intense 4-week diet and exercise programme. Their diet contained 40 percent fewer calories each day than necessary for weight maintenance (providing a total of 15 calories per pound of lean body mass). Half of the men were randomly selected to receive a higher protein diet (2.4 g of protein per kg body weight; 1.09 g of protein per lb. body weight; 35% protein, 50% carbohydrate, and 15% fat). The rest of the men were placed on a lower-protein diet (1.2 g of protein per kg body weight; 0.55 g of protein per lb. body weight; 15% protein, 50% carbohydrate and 35% fat). Though this diet was lower in protein, it provided 50% more protein than the RDA for protein (0.8 g/kg body weight per day). Both groups were given enough carbohydrate to sustain a higher-intensity training programme. Both the lower-protein and higher-protein groups lost weight, with no significant difference between groups. Men in the higher-protein group gained 2.64 pounds of muscle and lost 10.56 pounds of body fat, while men in the control group gained very little muscle (0.22 lb.) and lost 7.7 pounds of fat. Both groups improved all but one measure of strength in addition to aerobic and anaerobic capacity. There were no differences between groups in strength, power, aerobic fitness or performance at the end of the study. In this study, a higher-protein, reduced-calorie diet combined with a high-intensity circuit-training programme including interval training and sprints helped participants build muscle. In addition to their total protein intake, participants in the higher-protein group also consumed more protein per meal (approximately 49 g per meal) than those in the lower protein group (approximately 22 g per meal). Dieters who want to gain muscle while losing fat may want to consider consuming more than 2 grammes of protein per kilogramme body weight. Protein intake should be spaced out evenly throughout the day (regular meals containing at least 25–30 g of protein). Losing body weight, especially when done quickly and without adequate dietary protein, can lead to a substantial decrease in muscle mass. To prevent muscle mass losses when cutting calories, one must consume more total protein and engage in resistance training. However, rapid weight loss can also lead to a more substantial drop in metabolism, so this approach is not recommended unless needed for rapid reversal of obesity-related health consequences. Gaining muscle can improve quality of life in older adults and those who are disabled by helping them perform typical daily tasks. For athletes, gaining muscle can decrease the risk of injuries and improve strength and power. Greater intake of both calories and protein, as well as an effective resistance-training programme, is necessary for muscle hypertrophy. It is possible to gain muscle and lose fat at the same time. Doing this requires fewer calories, more protein per day, and a well-designed training programme. Like weight loss, individual results following a hypertrophy programme or programme designed for fat loss and hypertrophy at the same time will vary among individuals. Nutrition Concerns for Special Populations. Previous PostWeight gain during and post pregnancy – Who isn’t exercising? Next PostShould we re-frame how we think about physical activity and sedentary behaviour measurement?